I listed these in my top favorite new dishes of 2008 but I never had a picture to show before now. 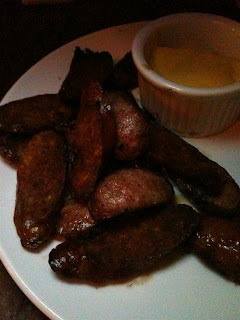 These are the insanely delicious beer sausages from Jimmy’s No. 43. They always make these sausage bites super crispy and come with a tangy mustard sauce that’s great for dipping. I enjoyed these meat nuggets with a crisp Helles Lager from Germany. Jimmy’s continues to be one of my favorite bars in the city. They always have a nice selection of beers, good food and a cozy atmosphere. This is just the prescription I need on a cold and rainy day.